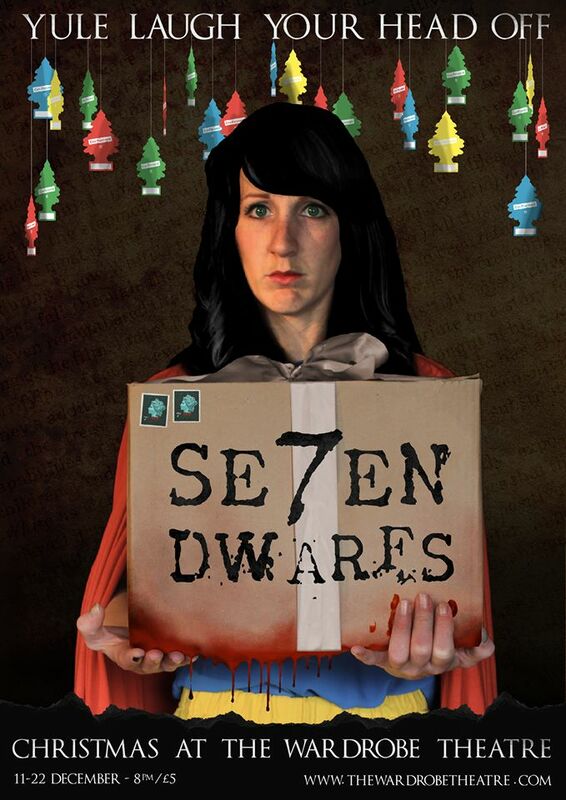 Billed as an anti-pantomime, Se7en Dwarves does away with the back end of a horse, Bobby Davro, and morals in favour of a darkly comic performance that is the perfect antidote Christmas tradition. The old “It’s behind you routine” scrapes through on a technicality that the audience is eventually told in no uncertain terms to F**k off. Loosely based on a mix of the classic 90’s thriller Se7en and of course Disney panto fodder Snow White, the story follows the investigations into a spate of grisly murders. After being forced to turn in her detective badge years earlier, Sner White (think ‘Game of Thrones’, “I’m John Snoeeeeerrrererr”) is back in the game to help former colleague, the hapless Detective Bramley get to the bottom of several dastardly crimes. The use of a projector (or ‘crime scene make big’ machine) was a great touch. The stage was illuminated with an intro comprising of shots intercut from the opening credits of the film Se7en as well as some hilarious festive additions including cloves being pushed into oranges and baubles swaying menacingly setting the tone nicely before the introduction of our two main characters. Detective Bramley (played by Adam Blake) is a product of every American detective film and TV show you have ever seen. With trenchcoat, an ineptitude in the line of duty and a propensity to sit on the corner of desks whilst glaring into the distance. At times, Blake drifted off into a accent and character not too dissimilar from Rick as played by Rik Mayall in the ‘The Young Ones’, which although almost certainly not intentional, only added to the hilarity. Bringing the brains (and more than a hint of sleep deprivation) to the evenings proceedings is Sner White herself. Before having seen the show, it would have been impossible to imagine how much energy could be dispelled in such a tiny venue. Sner (played by Emma Keaveney-Roys) was everywhere at once, often bellowing profanities within an inch of her hapless colleagues face. With her costume hinting at her fairytale namesake and the tendency to burst into sickly sweet song before another tirade of dark wit, Sner takes the plaudits for just as many laugh out loud moments. As well as some delightfully low-fi props (an office chair car with torches for headlights), the sound throughout was excellent and an easily unnoticeable track runs throughout the performance alluding to its film namesake. Some lovely live violin was provided by Vince Martin who also played some integral characters such as ‘Corpse 1’ and ‘Creepy double-necked-guitar wielding owl. The musical numbers towards the end of the show didn’t add anything for me, perhaps my own neglect of the works of ‘Prince’ goes someway towards missing the joke. The otherwise constant laughter from start to finish is though a testament to the concept which is executed perfectly and the show could fill easily fill much larger venues. In a traditional pantomime you may find a few risque jokes thrown in ‘for the parents’. Se7en has been crafted entirely for a grown up audience and as a piece of live performance is the most fun you can have in a dark wardrobe with your clothes on.